Mike Blumenthal recently wrote an interesting post on search modifiers. He focused on the term “nearby”, in connection with voice search, and investigated its trend over time. Even though he believes the parallel growth in smart phone usage is circumstantial, there may be some relevance in this comparison. While location and proximity remain top priorities for local searches, a recent Google study reveals that 88% of local searches are done using smartphones. These are consumers and travelers looking for addresses, directions, business hours, and product/service availability. In this study, Mike also observed that the peaks seen in the graph tallied with the peak travel season and the increased searches, when away from home, around restaurants and hotels. 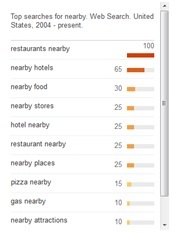 When considering the queries made alongside the “nearby” term, we see that “restaurants nearby” and “hotels nearby” are the top searches. These phrases also tie in the mobile and travel relevance. How does this trend impact the hospitality industry? Overall, this speaks good news and reiterates the significance of maintaining the correct Name, Address, and Phone (NAP) on your hotel’s website. 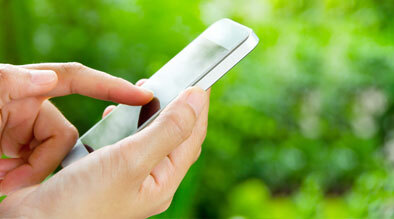 Google revealed that 1 in 2 consumers who used their smartphones for a local search visited the location within a day. It is important to leverage this behavior and garner potential customers who are ready to act and have a clear purchasing intent. For more information about local search, NAP consistency, and how Milestone can help improve your local search presence, click here to contact us.